Rika holds a master's degree in development studies from the University of Melbourne in Australia, and an undergraduate degree in economics from the University of Indonesia. Prior to joining SMERU, Rika worked as a teaching assistant and research assistant at in the Faculty of Economics at the University of Indonesia, and econometrics training assistant at Qiyara Damayanti Artiqa Consulting. Rika was awarded the Australian Awards Scholarship 2013-2014 for her postgraduate study. 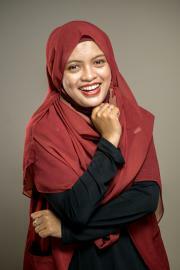 She was also awarded the Tanoto Foundation Scholarship 2005-2008 for her undergraduate study.